On June 15, 1957, the city of Tulsa celebrated Oklahoma’s 50 years of statehood with an event called Tulsarama. The city buried a brand-new, gold-and-white Plymouth Belvedere Sport Coupe in a concrete vault under the lawn of the Tulsa County Courthouse. The car, which was to be unearthed in 2007, was filled with objects that the citizens chose as representative of Tulsa. They included a woman’s purse containing bobby pins, lipstick, gum, $2.73, and a pack of cigarettes. In the glove compartment they placed a bottle of tranquilizers. In the trunk, a case of Schlitz beer. A few 16-millimeter movies were also buried inside the Plymouth. One, Destination Earth, is an odd little animated film that was produced by the American Petroleum Institute. It tells the story of an authoritarian government on Mars and its supreme ruler, Ogg. A Martian explorer visits the United States and returns to Mars to explain to Ogg that oil and competition are what make America (and American-style capitalism) so great. Keeping with the spirit of the film, the most interesting things included in the 1957 Plymouth were probably the 5 quarts of oil and 10 gallons of gas. Did the people of Tulsa believe that by 2007 technological advancements would have made gasoline a thing of the past? Its inclusion in the capsule was an implicit answer. People have been burying artifacts in foundations and cornerstones for centuries, but it was at the 1876 U.S. International Philadelphia Centennial Exposition, an event that would later become known as a World’s Fair, that the modern time capsule was born. The centennial capsule was the first to be sealed with a scheduled retrieval date: the American bicentennial in 1976. From shoeboxes full of letters to elaborate stainless steel enclosures, time capsules stamped with “open on” dates far into the future prompt buriers and diggers alike to look outside themselves and think about what kind of legacy they might be leaving. What we decide to save and show our descendants has a way of revealing our deepest hopes and fears. In particular, American time capsules buried since the 1950s tell the story of our relationship with oil. When President Dwight D. Eisenhower signed the Highway Act of 1956, the United States undertook the largest public works project in its history, constructing the vast network of interstate roads that would come to define postwar America. Still, faith in a post-oil future was a given. This period of tremendous growth and prosperity filled our heads with glorious techno-utopian visions. It wasn’t a matter of if but when we would move on to the next type of energy that would transport Americans and our goods across this enormous land. The story we told each other—and the dominant narrative in popular culture, in politics, in education—was that Americans were blessed with the power to innovate. Americans got things done. Americans were not content to let technology stagnate. Even if it already worked, Americans could make it better. Decades before the postwar boom there were predictions that the United States would exhaust its energy resources in short order. On July 19, 1909, Pennsylvania’sTitusville Herald ran an article about U.S. Geological Survey predictions for the future of energy and natural resources. The report forecasted that all natural gas would be exhausted by 1934, all petroleum and iron would be exhausted by 1939, and all coal by the middle of the 21st century. But what about people who were thinking even longer term? Say, to 8113? That’s the year the Crypt of Civilization, buried in 1940 at Ogelthorpe University in Atlanta, is set to be opened. The man behind the crypt, Dr. Thornwell Jacobs, chose 8113 in order to place 1940 as a chronological midpoint for civilization, using 4241 BC as the beginning. The crypt holds hundreds of items, many of them daily essentials from the five-and-dime. It also includes a mini-windmill to generate electricity. Burying new time capsules and unearthing old ones are often civic events. Inspired by Beverly Hills, which held a festival this fall in honor of its world-famous ZIP code, the Los Angeles neighborhood of Chatsworth decided to celebrate its own postal designation, 91311. On an evening in mid-September, locals gathered in the parking lot of a Presbyterian church for “Think 91311,” a celebration of the small community at the foothills of the Santa Susanna Mountains. A soon-to-be-buried time capsule was on display. I arrived to find a handful of people at tables promoting their businesses and organizations. When I asked around to see who might know something about the time capsule I had read about on the “Think 91311” website, the first few people had no idea that Chatsworth planned on burying anything. I finally tracked down Carol Lucas, secretary of the Chatsworth Neighborhood Council. An attractive middle-aged woman wearing clothes that might best be described as suburban cowgirl-chic, Lucas seemed skeptical of my interest in the time capsule. But she politely explained that she intended to fill the capsule with a signed baseball from the local Little League team, a yearbook from the oldest elementary school in Chatsworth, and photos of gas prices. 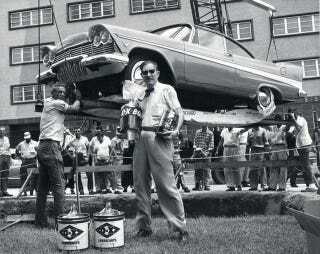 In 1957, the people of Tulsa made sure to include fuel with their car capsule. In 2011, four years after Tulsa’s Plymouth Belvedere was unearthed, the citizens of Chatsworth were documenting the cost of gas. They seemed to be offering future citizens a way to compare prices—a tacit prediction that we will still be using fossil fuels in 2061, when the Chatsworth time capsule is set to be opened. At first blush, time capsules seem like they are about defining who we are at the moment of creation. We compile this stuff in a coffee can (or a state-of-the-art, acid-resistant, stainless steel tube filled with argon gas and welded shut) to understand what we care about personally and, by extension, what things mean to us as a species. But really, we are looking to the future and guessing how people will live in 50 or 100 or 5,000 years. Time capsules force us to express our guesses with material objects. On July 4, 1976, President Ford attended a sealing ceremony in Valley Forge, Pennsylvania, for the national bicentennial time capsule. The capsule was supposed to contain the signatures of more than 22 million Americans, but the signature book was stolen from an unattended van at the ceremony. And so the capsule was sealed without the signatures.